This week, I’ll leave office after eight years serving as your Governor. It’s been the best, hardest, most rewarding job I will ever have, and I am deeply thankful to you for allowing me to serve. I’d like to leave you with a few brief, parting thoughts about our state and my hopes for its future. While we will often disagree among ourselves about how our government should operate, or what it should seek to accomplish, always remember that our common interests and beliefs far outweigh the differences between us. We all want good schools, safe and healthy communities, well-paved roads, beautiful parks, a clean environment, and basic services for those in need. We all agree Connecticut should continue to make wise and responsible decisions in developing its budgets, particularly when it comes to paying down the debts of past generations. All of these things come at a cost to you, the taxpayer; it’s a balance we strike, a spectrum of decisions on spending and revenue that becomes our budget each year. However you feel about any given budget item, I hope you’ll remember that as a state we all generally agree that we should collectively pay for these things. Anyone who promises you something for nothing – especially your elected officials – is ignoring that basic truth, and therefore not giving you the whole story. I also hope we can continue to recognize that, time and again, the people of Connecticut have shown a deep empathy and caring for one another and all of humanity; it’s an aspiration we should appreciate and continue to foster. Collectively, we have a desire for positive social change that is a rare strength in our country, and indeed in the world. We’ve led the nation on efforts to treat people more fairly and equally in the workplace, to find homes for veterans, to welcome those seeking refuge from war and poverty around the globe, and to focus on rehabilitation rather than punishment in our criminal justice system. We’ve done many of those things across party lines. Let’s give ourselves credit for it. Let’s recognize that our compassion and our decency are defining characteristics and core strengths of who we are as a people and as a state, and let’s make sure that the world knows Connecticut for this cause and this calling. I am deeply optimistic about Connecticut’s future, and I urge you to nurture your optimism as well. As I said, we are kind and resilient people. However, we’re often too quick to criticize ourselves and our great state – faster even than our own neighbors as we compete with them to attract jobs and grow our local economy. Of course, we have problems, and no we can’t shy away from them. But recognizing our very real challenges should not mean wallowing in them – it should simply be the first step in overcoming them. In other words, we can tackle big, historic problems while also remembering what’s great about Connecticut. We are among the best-educated, healthiest, and safest people in the country. We are home to some of the most esteemed higher education and research centers in the world, in one of the most scenic states in the nation. Our economy boasts a unique cross-section of small employers and large, keeping our residents working and leading in agriculture, in insurance, in manufacturing, in bioscience, and more. It is for all these reasons that I am so thankful to be from Connecticut, and that I will be glad to call it home for the rest of my life. I hope when someone asks you where you’re from, you will say Connecticut, and you’ll say it with pride. 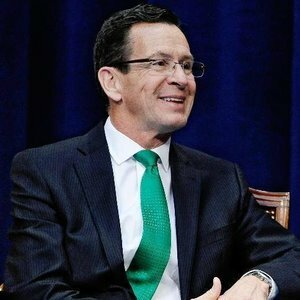 Thank you, may God bless you, and may God bless the great state of Connecticut.